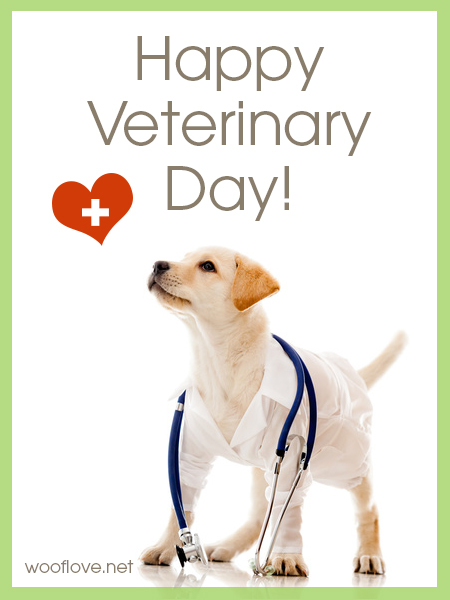 Happy Veterinary Day! I want to say THANK YOU to all veterinarians who love their profession and treat our pets like their own. They have patience and compassion, and they know how stressful is for a pet parent to have a "kid" sick. Thank you to Dr. Sanchez in Mexico City, to Dr. Donelly from Banfield in Vista, CA, and to Dr. Renee, Dr. Nancy, Dr. Rivera and Dr. Micaela in Baja. I was fortunate that in every city I lived, I found excellent Veterinarians. Today is their celebration! World Veterinary Day was initiated by the World Veterinary Association (WVA) since the year 2000 and it is celebrated the last Saturday of April each year. With the World Organization of Animal Health (OIE), they created the World Veterinarian Day Award to reward the best contribution to the veterinary profession. This year the theme is "The role of the veterinary profession in sustainable development to improve livelihoods, food security, and safety"
"Faced with global challenges such as the growing world population and the rise in demand for animal protein,the environment’s deterioration and decrease of natural resources and the emergence of zoonotic diseases, veterinarians are playing a crucial role in securing the development of more sustainable, responsible and efficient livestock production systems to ensure sufficient resources for future generations. " Submissions end on May 31st, 2018. If you want more information about this, click here for applications and background. Happy Day to ALL Veterinarians! You rock! Our day starts with a walk to the park, breakfast and a short nap, until I have to wake-up Winnie to go to the Vet. I ask her to smell my purse because she immediately knows that it means a ride in the car, and after barking, rolling and running to the door, the adventure starts. What Winnie doesn’t know is that we are going to the Vet. We arrive and she goes down from the car happy and relaxed, but when we get to the door… she turns back and wants to run away! like most of the pets who know there is no way out. But at the end she is calm because she knows everybody in this place loves her, from the receptionist who greets her with a smile, the Vet. who will make sure she is fine and everyone there who are so kind. I go to Dr. Rivera’s clinic since a long time ago. It is only minutes from the border of San Diego. Many visitors cross to “Baja” on the weekend to surf, relax and enjoy Mexican food. Some of them bring their pets and they have a blast. I am really happy with Dr. Rivera’s clinic. He is very professional and kind with animals. You can breath love all over the place. If you visit Tijuana and the area of “Baja”, Rosarito, Puerto Nuevo and the Winery Tours, Dr. Rivera has to be in your contact list. But the best thing of this adventure, is that Dr. Rivera and I are happy because Winnie, with almost 16 years old, is doing fine (despite the normal issues of her age). Next thing to do is to ask for her appointment with the groomer at Dr. Rivera’s! which by the way, she always comes back looking beautiful! This is a guest post from the wonderful people at Wiggle Less. When I read the story about the owner Lisa Luckenbach 's dogs, Henry and June, I was really moved. I didn't know this could happen and we want to share this post to help other dogs who may have the same condition. This post explains really well what IVDD is and what you can do about it. Please share it with dog parents so we can help as many dogs as possible. The actual IVDD diagnosis was a shock to us all. Having had dogs my whole life, I thought I knew the source of Henry's symptoms. I thought the origin of Henry's pain was stemming from his muscles, tendons, and ligaments but after taking him to my Vet, I learned the victims were his vertebral discs. Since I was still somewhat ignorant to the world of IVDD, when Henry and his younger sister June were both diagnosed, I thought… how could this be? How could Henry have the exact same diagnosis as June? June is much younger and far more active! When June started showing symptoms, I rushed her to the ER where the on-call vet administered Rimadyl for inflammation, Tramadol for back pain, and Roboxin to relax muscles. But the worst was yet to come, my rambunctious pet was to be “confined to rest” for a month! With a lot of diligence on my part, June recovered, only to re-injure her back when she was three years old! After a series of x-rays and veterinary examinations, I learned that June was a “chondrodystrophic” breed, which means a dog with short legs and long spines (but not always), prone to IVDD. When the vet told me that June’s back was like a “ticking time bomb” and suggested spinal surgery or maybe even euthanasia, I panicked. Was my sweet angel destined to a life of pain and other maladies than can accompany IVDD such as shaking, and loss of appetite and bladder control? I felt an immense sadness and frustration. To learn Henry was being diagnosed with the same thing was shocking. We soon learned that IVDD, or Intervertebral Disc Disease, is a degenerative disease that affects countless breeds at various ages and activity levels. It occurs when discs in the spinal column begin to shift so much so that they protrude outward, pressing against the spinal cord and its nerves. The discs are thick plate- or disc-like cushions, which lie between the bony vertebrae in the spine. They are composed of a fibrous outer layer called the annulus fibrosus and a pulpy, gelatinous center called the nucleus pulposus. They help to cushion the spine as your dog walks, trots, runs, twists, and jumps. As time goes by, the discs start to degenerate. The blood supply to the disc decreases, so the tissues are not so vital and resilient. The soft, gelatinous central material is replaced with harder cartilaginous material. We also learned that there are two types of IVDD and yes, both young and old dogs can have it! Type I can affect dogs at any age, and is mostly seen in (but not limited to) chrondrodystrophic dogs, or dogs bred to be shorter and stockier. (Examples of chondrodystrophic breeds are the Dachshund, Pekinese, Lhasa Apso, Shih Tzu, Basset, Beagle, and Poodle.) This type occurs when a dog’s spine experiences a sudden impact that causes the disc to shift out of place. Type II – the type Henry was diagnosed with — is more gradual but the results are the same: pressure on the spinal cord and its nerves caused by a bulging disc. Type II IVDD affects older dogs between the ages of 8 and 15 by its very nature, and isn't targeted to primarily chrondrodystrophic breeds. In the Type II disc disease, the tear in the outer layer is smaller and tends to occur gradually over a period of time. The central material tends to bulge up into the spinal canal but then will fall back into place between the vertebrae. This second Type tends to occur in breeds with normal cartilage. For both types, rest, laser light therapy, anti-inflammatories, and even surgery are the common protocol and can aid in helping to manage, if not completely relieve, dog back pain; however, older dogs suffering from Type I are less likely to bounce back as quickly as younger dogs and are more likely to experience continual back problems throughout their lives. Our lives changed forever when June and Henry were diagnosed with IVDD and a big part of my life revolved around finding ways to make their pain go away. Emergency room visits, strong medication and complete crate rest were not what I’d envisioned when we brought our sweet puppies home and caring for a dog with IVDD can be draining emotionally, as well as financially. It was hard for me to watch my pups not be able to play and jump around like ‘normal’ dogs, hear them whimper in pain, and watch them have muscle spasms. No dog mom wants to see their pups not well, especially when they are in physical pain. I realized that if June remained still, she wouldn’t injure her back. But what kind of life is that for a dog? Dogs need to be active. I had to find a way to keep June from twisting her spine and wiggling so much, while she went about her daily business. That’s when the solution came to me. June needed a back brace for dogs, something like what the chiropractor gave me when I had injured my back. I immediately combed through the pet shops and searched online. I even asked my vet for a dog back brace, but there was nothing out there that would work for June. Unwilling to give up, I hired a seamstress and together we designed a vest with strong boning to keep June from wiggling. And guess what? It worked! And that was the very first WiggleLess® dog back brace. It afforded June the comfort and stability she needed to live a full, comfortable and happy life and we’ve been making them ever since! I had always felt a special kinship with animals and had been trained in animal massage therapy as well as animal communication. Instinctively I knew my dogs needed more than strong medication and crate rest. My most important goal for my pups became returning them to a happy, pain free life. The journey was long with my first two dachshunds; however, thankfully understanding the world of IVDD, and managing the pain our pups can sometimes feel, is becoming easier to do as we learn more and more about this dreaded disease and the many preventative and supportive measures we can take as pet parents. We are also sharing more stories of how we can make strides towards wellness and bring relief to our fur babies. It is important to keep a close eye on your pups in general, but pay special attention if you notice any of the following signs, as they can be early warnings signals of a bigger issue, and you may need your Vet’s immediate input. Diet – maintain your dog’s healthiest weight to reduce stress on their backbone and neck. Making sure they have the proper nutrients and supplements is paramount during the healing process and your Veterinary can offer guidance if you are unsure what your dog’s optimum weight level should be. Food – moisten kibble or feed them wet food. Chewing can cause stress on the jaw and neck, which can result in pain. Same goes for chew toys or treats. Abstain from these during the recovery period. Eliminate stress on back and neck – raise food and water bowls so that your dog doesn’t have to bend down to eat or drink; keep the crate your pup is recovering in at a higher level so that he doesn’t have to raise his head to look at you or his surroundings. There are some great products on the market which allow your dog’s to comfortably retrieve their food with minimal effort. Acupuncture Therapy – this is particularly good for dogs that respond poorly to or cannot tolerate medication. Surgery may not be an option due to health or finances. Acupuncture may be one option to look into, as it regenerates neurons mobilizing stem cell regrowth. Laser Light Therapy – although costly, LT has been proven to reduce tenderness, pain and speed up the tissue healing process. Be sure to research this method and talk to your Veterinary before considering this as an option. Back support – after a period of recovery, it is important to keep your dog’s back stable and straight. Wearing a back brace such as WiggleLess® puts less pressure on your dog’s spine and may help him or her to have a more enjoyable and normal life. Environment - lots of love, comfort, warmth, encouragement, and a peaceful environment. Soft bedding, ramps, extra cushions and support will make your dog less likely to be in a position of distress. Dogs get stressed out just like us humans do. Stress makes it hard to heal! Do remember that all drugs have side effects and some (steroids and NSAIDs) need to be given with a stomach protector. Steroids and NSAIDs should never be mixed or switched without washing out the other from the body for 7 days. Ask your vet or pharmacist for an informative brochure on each drug or search the web for adverse side effects. WiggleLess® was created to do one simple thing: HELP DOGS! There are wonderful pet lovers out there and I come across amazing parents every day who make my work incredibly rewarding. June and Henry have both passed on (not from back problems), but they were the inspiration behind WiggleLess® and I am determined to share what I know and continue to learn with anyone who loves dogs as much as I do. With the right diagnosis and the right treatment, IVDD is manageable, and remembering the simple ingredients it takes to make your dog feel loved and happy is top of the list. At WiggleLess®, we strive weekly to work with the local community and our friends across the US and abroad to bring IVDD to the forefront of the pet community so we can all learn and share but most of all help all our beloved dogs to live the longest, healthiest lives possible. AUTHOR BIO: Lisa Luckenbach has developed WiggleLess® back braces for dogs that are overweight and need extra support, elderly with aching backs, diagnosed with IVDD-related back problems, or overly active and can benefit from the structure a dog back brace provides. In addition to running WiggleLess®, Lisa is a registered yoga instructor, licensed massage therapist, public speaker, ordained minister, and breast cancer survivor. She shares her home with her husband and three spunky, adopted dogs, Ryder (Cocker Spaniel), LaVerne (Schnauzer/Doxie mix), and Chai (Doxie/Jack russell mix). Visit WiggleLess®.com to learn more about Lisa and her back brace for dogs.